Throughout the 1800s, the lands that the Newhall Street neighborhood sits upon were sparsely populated areas with many wetlands and large farms. One of the largest farms in the area was the Goodrich Farm, which was approximately 122 acres in size (Haley & Aldrich, p. 26). An 1852 map of the area (shown below) indicates the location of occasional buildings (small squares) along the main roads, sometimes with the owner’s name, but overall shows very little development. 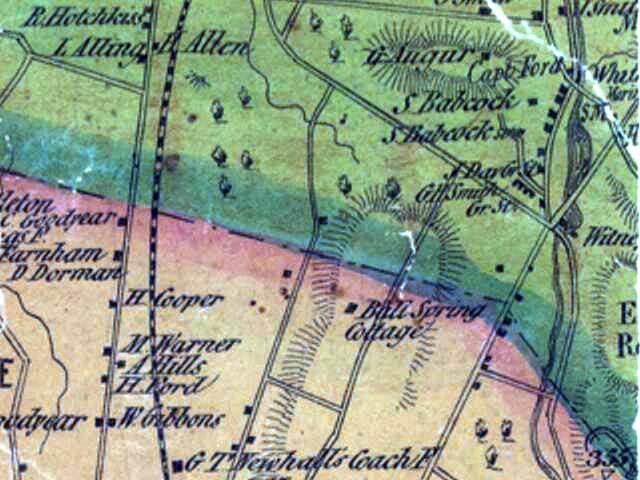 A detail of the Map of the County of New Haven, 1852, showing the buildings, some landowners, and landforms present at that time in the vicinity of today’s Newhall Street neighborhood in Hamden. The boundary line between Hamden (in green) and New Haven (in tan) is visible in the middle of the map. Dixwell Avenue and the railroad line run north-south at the left. 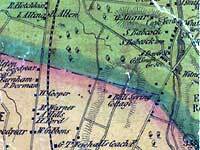 The Goodrich Farm, not labeled on the 1852 map, was approximately in the center of the map and included the lands now occupied by the Hamden Middle School and athletic fields. The area east of Newhall Street was slowly developing during the 1850s, as shown in a map from 1855 (below). 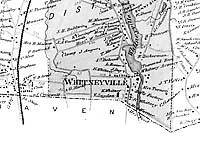 It was during this period that the southeast section of Hamden just north of the New Haven town line became known as Whitneyville, in honor of the Whitney manufacturing operations located east of the Lake Whitney (called Lake Whitneyville at the time). 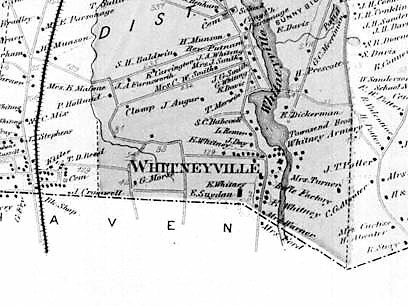 A detail of the Whitneyville section of Hamden (later the Newhall Street neighborhood) from an 1855 map. In those years there were a number of small ponds, lakes and streams in the area. In the map below, there is a stream beginning at Goodrich Street, running north and northwesterly, cutting through what is now the Hamden Middle School property,towards Pine Swamp. Mix Pond was located just north of Morse Street and west of what are now the Newhall Street Soccer fields. As late as 1920, a small “duck pond” was located east of Winchester Avenue and south of Morse Street (Haley & Aldrich, p.27). Prior to 1917, a “skating pond” existed in the block bound by Morse, Goodrich, St Mary’s and Edwards Streets. A large wetland area was located on the western and southern portions of what are now the Newhall Street Athletic Fields all the way to Newbury Street and along the eastern side of Winchester Avenue. Another wetland of approximately four acres occurred in the block surrounded by Goodrich, Newhall, Butler and Marlboro Streets. Sometime in the 1860s, the Goodrich property was sold. Subdivision of the land into smaller building lots began in 1870 (Haley & Aldrich, p. 26). According to an 1870 map of Hamden, streetcar (trolley) service ran along Shelton and Winchester Avenues by this time, indicating that more people needed to travel to and from that area. There was even a trolley station located at the corner of Shelton and Goodrich Streets (Haley & Aldrich, p. 27). Despite these signs of residential growth, an 1879 map shows that homes were still uncommon in the area, although a grid of streets was forming. 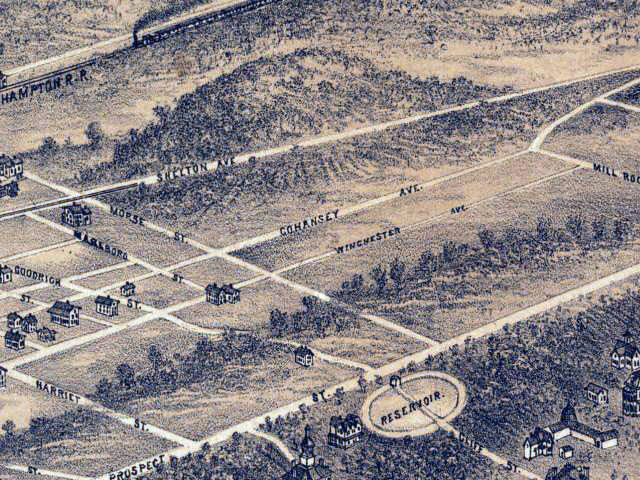 View of New Haven, including the southern portion of Hamden, 1879. The map shows many of the streets that are in existence today. Note that Newhall Street was once called Cohansey Avenue. In the early 1900s, this District included approximately 121 building lots between Winchester and Shelton Avenues. During this time, Morse Street was also extended further east to make room for more houses (Haley & Aldrich, p. 27). Much of the new growth was needed to provide housing for workers employed at the Winchester Repeating Arms Factory. It was during this period at the beginning of the last century that a community was formed and the area surrounding Newhall Street became known as the Highwood District. Winchester Repeating Arms (WRA) was the largest employer in the neighborhood. Around 1900, WRA employed over 2,600 workers. Formed in 1866, WRA made rifles, ammunition, and shotguns at their Winchester Avenue factory in New Haven (Haley & Aldrich, p. 64). Many of the residents in the Highwood District of Hamden, Whitneyville, and the neighboring districts of Whitneyville and Newhallville on the Hamden/New Haven border were employed by WRA. 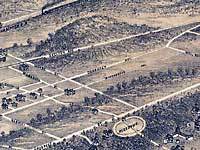 Newhallville was named for George T. Newhall, who owned a successful carriage factory in the late 1800s that employed many workers in this part of New Haven. During World War I (1914-1918), arms and munitions production at the WRA plant expanded to meet the needs of the military campaign. This expansion required more workers and so the surrounding communities continued to grow. Image of the massive Winchester Repeating Arms Factory in New Haven. During this period (in 1917), a new elementary school -- the Newhall Street School (the building that is now the Hamden Community Center) -- was built to serve the growing neighborhood (Haley & Aldrich, p. 47). By 1924, the number of homes in the area had greatly increased, as seen on maps from that year. In addition, several small businesses were present. Other changes in land use came in the following decade. Hamden Airport was located on the site of the current industrial park in the early 1930s (Haley & Aldrich, p. 63). Mill Rock Park was developed as a park in 1939 and 1940, after being used for many years as a refuse dump (Haley & Aldrich, p. 49). Rochford Field was built in 1939 over the dump. Shortly after World War I, WRA began manufacturing much more than weapons. They made items ranging from refrigerators to batteries and roller skates. The manufacture of such a variety of products was not successful and by 1931, WRA was broke. The company was purchased that same year by the Western Cartridge Company, a subsidiary of the Olin Corporation (Haley & Aldrich, p.65). After 1931, the company was known as Winchester-Western, which would later become Olin Industries (Haley & Aldrich, p. 65).